Please read the entry for the Commodore 128PC before proceeding. In the late 1980s, Commodore decided to throw it's loyal 8-bit users another bone, releasing the Commodore 128D. The Commodore 128D is similar in most ways to the Commodore 128. The 128D, however, comes in a professional desktop case, has a built-in 1571 disk drive, and includes both an upgraded power supply, and a detachable keyboard. The Commodore 128D also included a less expensive "upgrade" version of the SID (sound) chip, called the 8580 SID, as well as special software in the 1571 disk drive motherboard that discouraged pirating software from operating correctly. This original Commodore 128D was released in Europe with a plastic case. The computer includes a built-in handle to carry it around, as well as a mount in which you can dock the keyboard. Interally, the original C128D consists of two main boards : a slightly modified C128 board, and a special 1571D board. In the United States, Commodore released another Commodore 128D (also known as the Commodore 128DCR, for 'Cost Reduced'). This version comes in a sturdy metal desktop case, without either handle or keyboard dock. 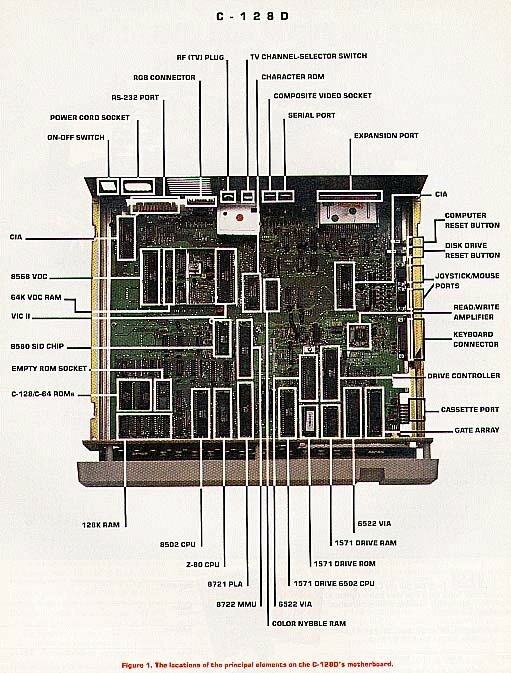 The 128DCR motherboard was redesigned to be an integration of the Commodore 128 motherboard with the 1571 disk drive motherboard, which allowed them to be produced more cheaply. Although the original C128D was not released in the United States as such, it was designed here. Thus the unit in this collection is actually an American NTSC prototype C128D, as opposed to the production PAL models found in Europe. It even appears to have a name enscribed on the serial number sticker: "KENTORN". Perhaps the name of an engineer? The 128DCRs in this collection are also NTSC American units, from a standard production run. Personal Note: The Commodore 128D is a great computer. I upgraded from a C128 back in 1992 and have never looked back. Probably purchased at a Target store or the like. The Commodore 128D (euro-release) I got from a German auction site.